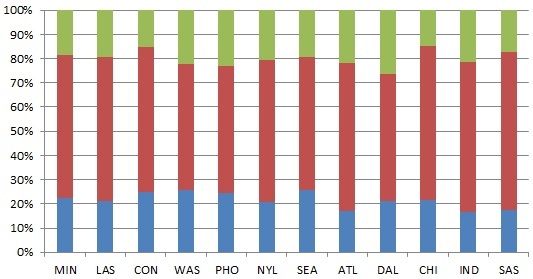 Let’s take a look at how teams stack up statistically at the All Star Break. 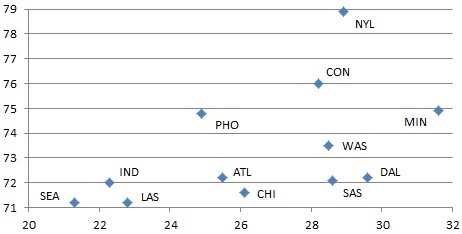 Teams are sorted in order of offensive rating with the blue bar representing points per 100 possessions scored and the red bar representing points given up per 100 possessions. It is no surprise that Minnesota dominated in both categories with Los Angeles also scoring well. At the other end of the spectrum, San Antonio struggles offensively compared to every other team. New York continues to enjoy a strong defensive record while Indiana and Dallas bring up the rear. With coaching and personnel changes in the offseason, let’s take a look at the difference in each category compared to the end of last season. The blue bar represents the change in offensive rating while the red bar represents the change in defensive rating with a positive number meaning fewer points given up per possession compared to last season. The green bar combines the two and measures change in net rating. Minnesota led the league in both categories last season and their figures so far this season are even better than those marks. 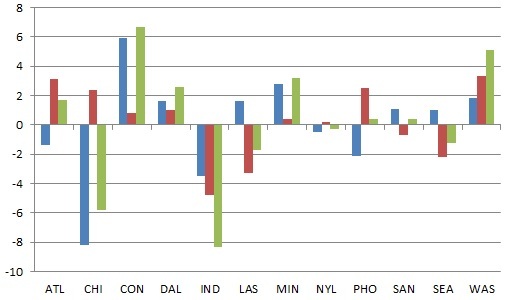 Los Angeles has increased their offense, but their defense has regressed, leading to an overall decline in net rating. The improvement of Connecticut and Washington in the standings can be seen clearly with their increases in both categories this year with Dallas also seeing positives in both numbers. Indiana on the other hand, has struggled in both offense and defense with such important changes. San Antonio may have the worst offense in the league at this point, but it is actually an improvement from last season’s mark, which was even further away from the second worst offense. Chicago had the second best offense a year ago, but now have the second worst as an improvement on defense was nowhere near enough to offset that on a net basis. Different teams generate their offense in different ways as the blue represents percentage of points coming from behind the arc, the red represents points inside the arc, and green represents points from the free throw line. Trends this year so far are not as extreme as they were last season. Chicago is the team with the lowest percentage of their points coming from the stripe while Dallas has a clear lead on other teams from there. Four teams score more than 25.4% of their points from long distance, but there is no correlation between that and scoring less from the free throw line. One of the main advantages of more current approaches to statistics is the breakdown of rebounding into both offensive and defensive percentages to better measure teams that are stronger at one end than the other. The x-axis measures the percentage of available offensive rebounds that each team grabs while the y-axis measures the percentage of available defensive rebounds that are collected. Even with the separation of the two figures, it is clear that Seattle struggles on both ends as they come in last in each category. New York’s strong defense is certainly aided by their defensive rebounding, preventing their opponents from getting additional opportunities to score. Minnesota also has solid defensive rebounding numbers with their league leading offensive rebounding helping fuel their high powered offense. Los Angeles continues to have a great offense even though they do not generate second chances for themselves, speaking to their solid efficiency.